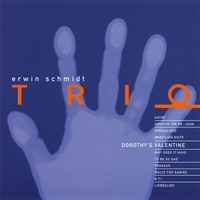 JM-2036-2 ERWIN SCHMIDT "Dorothy’s Valentine"
As one of the main sideman piano players of Austria, it was just a matter of time that Erwin Schmidt would make this first trio recording as a leader. Here we feel the real workmanship of a fully developed musician! Harmonically perfect and inventive, not too much-not too less notes and with a very good atmosphere! And his sideman are as round talented as he is himself: Joschi Schneeberger on bass and Walter Grossrubatscher on drums catalyse the swingin’ of the leader.